My perspective on this was crafted through my own experience co-writing a play with my son. I’m a playwright by trade, and in 2015 I was commissioned by Plan-B Theatre in Salt Lake City to write a play for their Free Educational Festival (FEST). 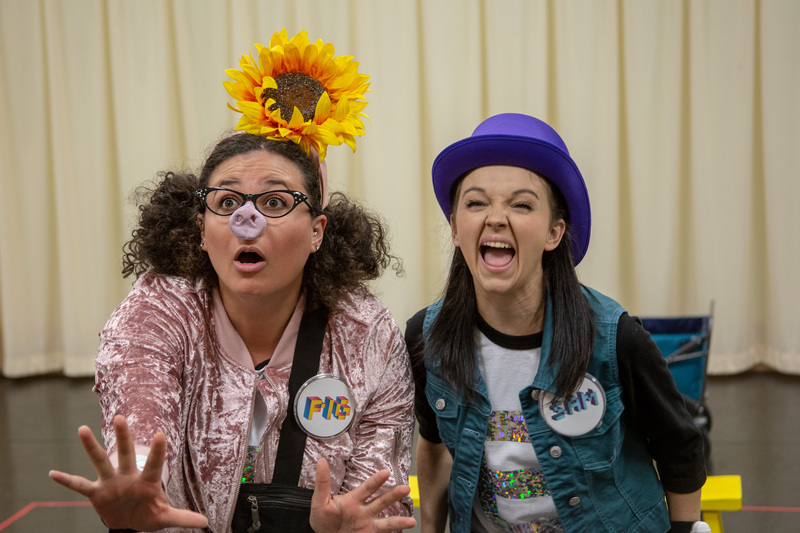 Although Plan-B is not known for children’s shows, in 2012 the artistic director Jerry Rapier and managing director Cheryl Cluff had begun adding a touring show for young audiences—alternating between K–3 and 4–6—into their season. Over the last six years, Rapier and Cluff have grown this tour to reach roughly eight thousand students at over sixty schools across Utah. 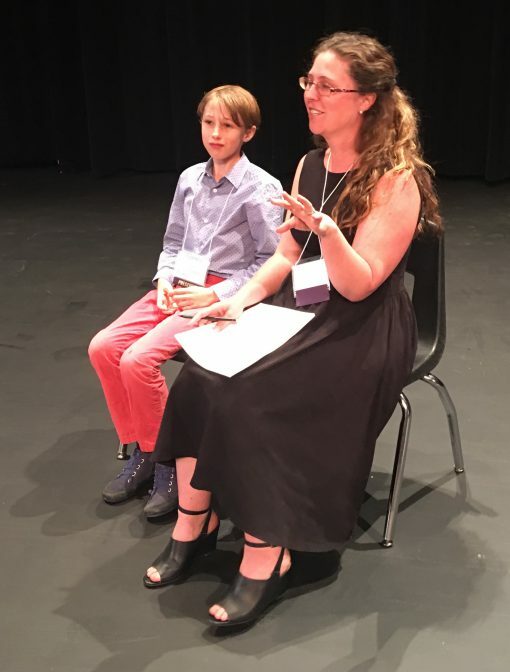 Having never written a play for young audiences before, and daunted by the task, I turned to my then-nine-year-old and asked if he was interested in writing with me. Even though he had never written a play, I suspected he had a better idea of what upper elementary students would want to see onstage. He agreed. Both of us felt pretty sure we had no idea what we were doing. Over two years, spanning ages nine to eleven for him, we developed Zombie Thoughts, which is a play about Generalized Anxiety Disorder (GAD). Oliver was diagnosed with GAD in kindergarten, and when we were talking about the subject of the play, he decided it was the most crucial thing to explore. Zombie Thoughts is set in the world of an eponymous video game and follows the adventures of Sam, a nine-year-old with anxiety, and Pig, a wacky pun-telling sidekick, as they battle the evil Machine, who creates new level after level, forcing Sam to confront the things they are most scared of. The roles are written entirely neutral and can be performed by anybody, and the audience directly influences what happens in the story by voting—the first vote determining which actor plays which character. It is possible to kill the characters at one point and they’ll respawn, a choice audiences frequently and gleefully choose. Even though he had never written a play, I suspected he had a better idea of what upper elementary students would want to see onstage. Ollie and I developed the play together by going on walks and having conversations that we recorded on my phone. In addition to anxiety, Ollie deals with dysgraphia, which creates a disconnect between his thoughts and his ability to get them on paper. Together we brainstormed ideas and improvised dialogue, and then I took what we had verbalized and put it down on paper in script format. The idea of setting the play in a video game was his, as he loves them. The audience directly impacting what happens made sense for him, as video games allow players to choose their avatars, to outfit their characters with clothes or possessions, and to directly impact their entertainment. At one point, for budgetary reasons, we were asked to turn the play from one with three characters—Sam, Pig, and the Machine—to one with two. After we struggled for a bit on how to handle this, Ollie suggested we give the characters a phone with an app that could serve as the third character, the Machine, delivering information to Sam and Pig. When I told him that was brilliant, he shrugged and said as a kid he’s grown up with smartphones and apps as part of daily life and that he wasn’t smart, I was just old. Outside of the logistics of the play’s structure, one of the most important parts of writing this play with an actual kid struggling with learning and emotional disorders was an opportunity to speak about childhood anxiety with honesty, so that we could truly depict how this shapes a life. It’s an honesty that, along the way, has shocked and scared adults, including playwrights at developmental readings, audience members, and directors producing the work. The last thing Sam confronts in the play is the Machine telling him, in the voice of his mother, that his parents no longer love him, and then that they’ve died in a car accident. These are the two things that scare both the character Sam and the person Oliver the most. After an early read-through, adult playwrights in the room argued that it was too much, but Oliver insisted (and was backed up by the therapist, Gennie Tucker, who Plan-B invited to consult) that these indeed are the things that scare kids the most, but by not discussing them or allowing children to learn how to process these scary ideas, they are hurting them. Well-meaning adults, including myself, would have pulled their punches out of fear of scaring kids or upsetting adult gatekeepers, and would have created a less effective play in doing so. 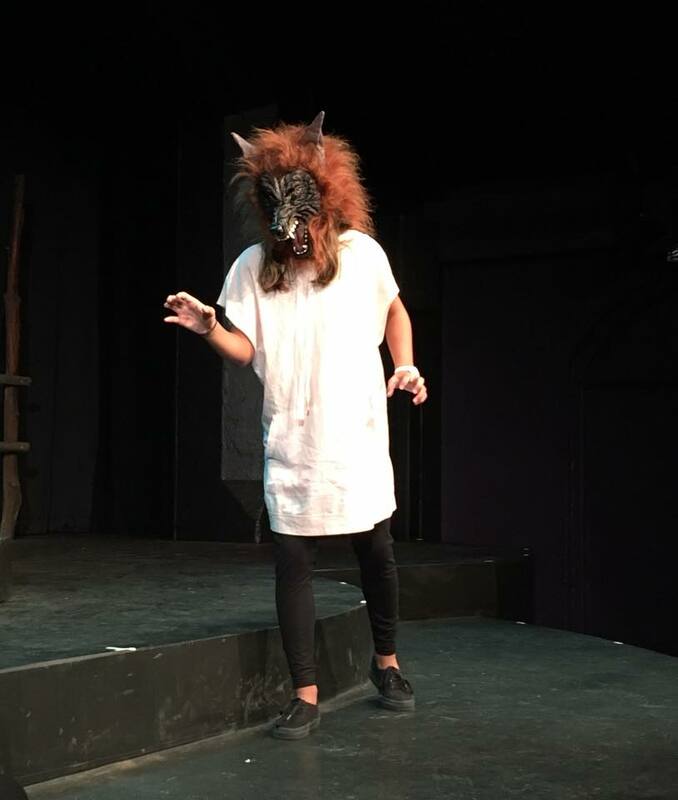 When it’s come to presenting Zombie Thoughts, professional theatres run by adults have tended to find the least scary options for the Demon Wolf and Goblin masks the play requires, while a school production in Hawaii went all-out on the most terrifying wolf mask they could find. Young artists are more interested in depicting the truth of the feeling than rationalizing, covering up, or shying away from emotions the way adults have been taught to do. Adults have frequently told Oliver he is brave for his honesty about his anxiety disorder, the negative behaviors that come with it, and the ways it has isolated him in life. But he doesn’t see the experience of writing Zombie Thoughts as bravery, because it is simply putting on stage how he feels. It is his life, why should it be shameful? At age nine, his perspective on these issues was very different from most adults, and I saw my role in the process as helping him say what he thought needed to be said. Young artists are more interested in depicting the truth of the feeling than rationalizing, covering up, or shying away from emotions the way adults have been taught to do. Although Ollie is Plan-B’s first nine-year-old playwright, the theatre company and the playwrights associated with it have an ongoing commitment to youth dramaturgs for all TYA productions. As Rapier says, “The most in-tune adult playwright has to be reminded on occasion to view elementary students as intellectual equals. Ollie is the first FEST playwright to be part of the age group that was also the target audience. We never had to worry about condescension.” If not actively written with young voices, each Plan-B play is developed with feedback from the appropriate age group throughout the process. “I would go so far as to say it’s irresponsible to not do something similar for every TYA play,” Rapier adds. The importance of this is felt by other writers too. Rachel Bublitz is working on both a FEST play for Plan-B and is on her second commission for the Egyptian YouTheatre in Park City, Utah. Both of these are being developed with active and participatory dramaturgy from young people. She says that being in a room with young people during table reads, workshops, and rehearsals had her checking her preconceived notions of what she thought young people were like and what they wanted in a theatrical piece. The process became about “listening to the flesh-and-blood humans sitting in front of me,” who laughed when she got it right and gently nudged her when she got it wrong. Involving young people in the production process does mean that a theatre company needs to be flexible and patient. Young people are astute in judging the merits of artistic work in progress and with their dramaturgical questions. My notebooks are full of Ollie’s chicken-scratch handwriting considering whether the play was universal enough, his tendency to get fixated on details meant continuity tracking was a breeze, and he pushed back strongly when an audience member at an early reading argued that children do not know the word “anthropomorphic.” That said, Ollie and other younger voices I’ve observed at readings are still young and not attuned to economic restrictions or who on the production team is responsible for what. A young playwright is likely to be startled to discover that revisions are expected and necessary and may take years. They might try to direct or sound design and not know that’s not their job as a writer. They might raise serious dramaturgical issues that should be addressed but not be sure how to phrase them correctly, so may easily step on toes. These issues can be compounded when dealing with a young person who is neurodiverse. In order to take these young artists seriously, adults will have to adjust the way they work, figuring out how to modify their process to allow for these alternative perspectives. In the case of Zombie Thoughts, in addition to our exceptionally well-received Utah tour, the play has been be performed by State Fair Community College in Sedalia, Missouri; by St. Andrews Schools The Priory in Honolulu, Hawaii; by Off-Key Anthem in Chicago, Illinois; and is now touring with Building Better People Productions in the “DMV Triangle” (Washington DC, Maryland, and Virginia). The play’s success vastly exceeded my original expectations, and, despite being written with a young person for young audiences, has been enthusiastically received by audiences of all ages. I believe its success is directly attributed to the authentic voice, brutal honesty, and perspective of my co-writer. I love that you two connected here James & Jenny! Thanks for sharing your story and beautiful development path for Zombie Thoughts. May it have a long, rich life with audiences. And I agree about developing work with young people as part of the process. Many theaters do this as a matter of course now -- it makes sense. And many writers writing for younger audiences are writing plays that are kid-centered, respectful, challenging, theatrical, playful, and complex. Those plays are often harder to get widely produced -- much like theaters producing for adults, TYA is still driven by titles and well-known stories. But that hasn't stopped writers from stretching/pushing producers to deepen and widen the canon of plays produced for younger audiences. Wishing you and your son all the best -- what a beautiful process the two of you created for your play! Thank you so much for reading! I completely agree that there is a divide between amazing work that people are writing and the tendency to produce works with names that might not be quite as inventive. Like most theatre, where you live and what money you have dictates what is accessible to you (and I certainly experienced this as a parent taking my son to plays). On a personal note, I think I met you many years ago when you came and spoke to us at Butler Theatre. Thanks for taking the time to talk to young playwrights! Thank you so much for your response! I am glad this was thought provoking for you. I know this experience was profoundly important to my son as he felt he had a voice and mattered in a way he hadn't before. I am glad you are doing that important work in Malawi!